My character is Frantz from Rusty Hearts. 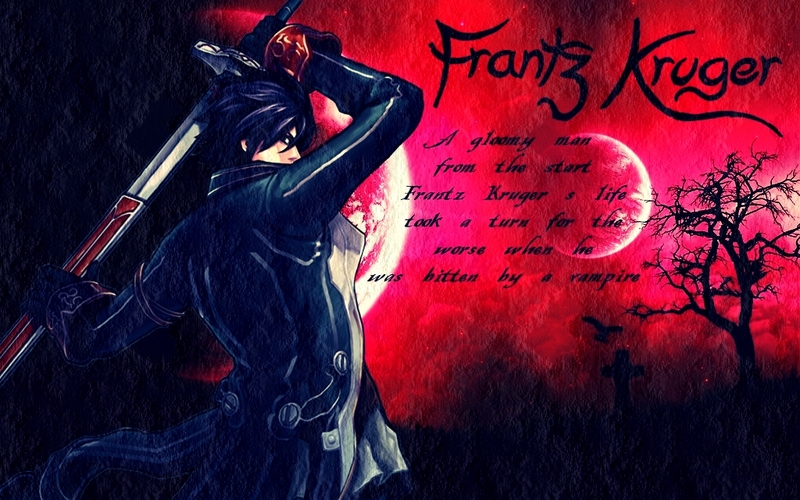 Frantz is a hybrid human-vampire and one of the playable characters in Rusty Hearts. He holds a strong grudge against Lord Vlad and wields a Sword , an Axe or Twin Swords, depending on his weapon specialization. I feel it in my veins, covering my heart in rust..."
A gloomy man from the start, Frantz Kruger's life took a turn for the worse when he was bitten by a vampire. Unable to resist the temptation, he bit just one person—his fiancée Amelia after she was involved in a tragic and life threatening accident. Frantz bit her only to save her life, but at the same time doomed her to the life of a vampire. At the time of the incident. Frantz was only a half-human, half-vampire hybrid, and instead of letting the blood complete his transformation, Frantz sealed the blood inside of him and used the force of his own will to halt the process. He now exists as a creature trapped in limbo between human and monstrosity. As a side effect of his condition, he suffers from chronic anemia and insomnia, giving him an ashen appearance and a sullen, sarcastic disposition. Soon after, Amelia mysteriously vanishes leaving Frantz behind. His only mission in life has been to return the blood that he took from his fiancée, and give her a chance to lead a human life once again-even if it means the end of his own. Until now his efforts have been fruitless, but deep inside Castle Curtis, Frantz catches a glimpse of his long-lost fiancée and wonders if his search is finally over. He is strong against black elemental and weak against light elemental. He is an user of black magic, including some barriers for debuffs. He has some vampiric abilities like draining the enemies energy(which happens depending on the weapon type you use). Frantz has fought many monsters, finished many missions, for Joheim to notice his strength, and accepting him as a disciple. Joheim is a master swordsman, yet also specialized enough in the use of hammers. Under his tutor, Frantz became specialized in the use of dual swords - a focus he chose. While Frantz can still fight using an axe or a single sword, he is almost always seen fighting using his chosen focus. He rellies on speed in both movement and attack to fight. When focusing fully on hitting, he can swing his swords up to 5 times per second! In order to approach enemies, he can also teleport a short distance of up to 3 meters. While he can also cast magic - mainly black sorcery -, he barely uses it anymore, since both of his hands hold a sword, hindering his casting ability. Without using hands for casting, he can still use magic to mainly imbue his swords with dark elemental, as well as creating up to two Dark Materials surounding him, which he can control at will within a range of about 10 to 15 meters. He uses Dark Materials mainly to approach enemies, or to analyze the enemy's strength. He can create more than 2 Materials would he use his hands, but since it is a basic spell with low magical damage, it is way more efficient to not let go of his swords. Frantz is specialized in short distance combat, but when it comes to it, he'd hold both swords with one hand, and uses the other hand to cast a magical lance and throws it at enemies to pierce them. He could also charge it for up to 4 seconds to increase the diameter from ~20cm to ~60cm, and length from ~1.2m to ~2.5m. Aside black sorcery, he also uses very few summoning skills, such as Bleeding Hand, a medium sized magical hand of about 1.5 meters long, coming forth from the ground, which he can summon only a short distance of about 25cm from his hand he'd use for casting the summoning spell.